Friedrich Carl von Savigny, the founder of the German Historical School, died on October 25, 1861, today exactly 150 years ago. In his birth town Frankfurt am Main the International Max-Planck-Research School for Comparative Legal History organizes a two-day conference to commemorate Savigny. The conference with the title Savigny International? looks in particular at the influence of Savigny outside Germany. Savigny’s works have been translated into many languages. At the Goethe-Haus in Frankfurt Joachim Rückert will present a study with fifty contemporary portraits of Savigny and a new biography. If you want to find quickly some portraits of Savigny you could try using BPKGate, the image portal of a number of museums in Berlin, or look at at the online version of his biography in the Neue Deutsche Biographie. I point to some portrait databases at the end of my webpage concerning digital collections. In this post I will look in particular at the ways one can access Savigny’s legacy in libraries and archives using archive portals and other gateways. The highlights of Savigny’s life are well-known and need scarcely extensive description. He studied law in Göttingen and Marburg where his interest in legal history was awakened and fostered. From 1800 to 1804 Savigny taught at Marburg. He came in close contact with major figures of the German Romantic movement and even married Kunigunde Brentano, a sister of Clemens Brentano. In 1803 Savigny published a monograph on possession, Das Recht des Besitzes. Not only was this monograph a model of its kind, but it dealt with one of the most discussed and vital subjects of law in the age of the French Revolution and the Industrial Revolution. Savigny taught from 1810 onwards at the new university of Berlin. An academic debate with Anton Friedrich Just Thibaut about the role of law in German society and the need for a German code of civil law led Savigny to the publication of Vom Beruf unserer Zeit für Gesetzgebung und Rechtswissenschaft [On the call of our time for legislation and jurisprudence] (1814). In 1815 Savigny founded with Karl Friedrich Eichhorn and Johann Ludwig Göschen the Zeitschrift für geschichtliche Rechtswissenschaft. 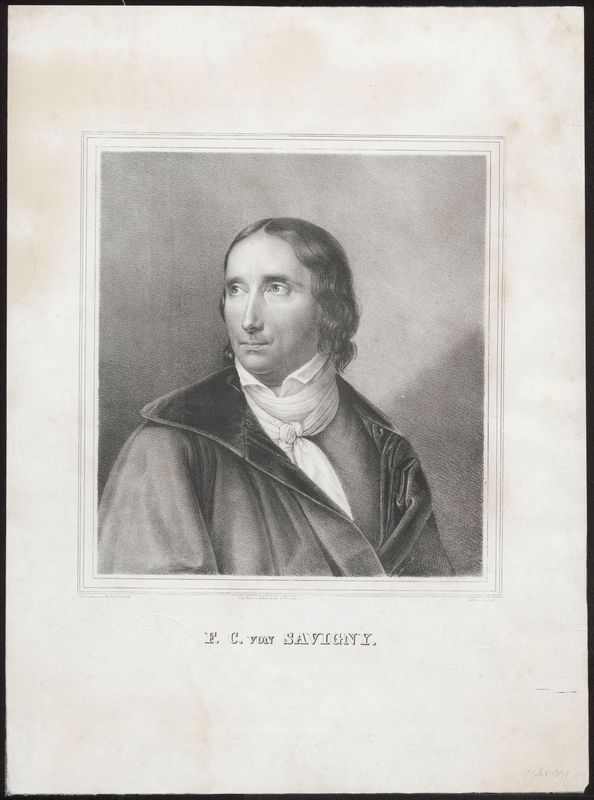 Already before the start of his opus magnum on the history of Roman law in the Middle Ages, Geschichte des römischen Rechts im Mittelalter (first edition 6 vol., Heidelberg, 1815-1831) Savigny emerged as the foremost lawyer of his generation. In the field of contemporary law his System des heutigen römischen Rechts (8 vol., Berlin 1840-1849) is his most voluminous publication and certainly one of his most influential works. In the digital library of the Max-Planck-Institut für europäische Rechtsgeschichte, Frankfurt am Main, you can consult online several of Savigny’s works. The number of editions of Das Recht des Besitzes is just one of the signs indicating the place of Savigny. Savigny was not just influential through his teachings. He was in close contact with many German and foreign scholars. In his own Zeitschrift he announced in 1817 Barthold Niebuhr’s discovery of the palimpsest manuscript at Verona with the text of Gaius’ Institutiones (Verona, Biblioteca Capitolare, XV (13)). Niebuhr thought Ulpian was the author of the text he had discovered, but Savigny judged otherwise. In the project Savignyana of the Frankfurt Max-Planck-Institut a series appears since 1993 with both editions of Savigny’s lectures and studies on his work. The discovery, study and editing of the Gaius manuscript is a major theme in Cristina Vano’s Der Gaius der Historischen Rechtsschule. Eine Geschichte der Wissenschaft vom römischen Recht (Frankfurt am Main 2008). The latest volumes in the Savignyana series are a collection of articles by Joachim Rückert, Savigny-Studien (2011) and the volume on portraits of Savigny, Savigny-Portraits, Joachim Rückert, Beate Rizky and Lena Foljanty (eds.) (2011). Savigny’s material legacy is not to be found at just one German city, because Savigny does not belong to one city, and thus apart from the Staatsbibliothek Berlin-Preussischer Kulturbesitz and the Universitätsbibliothek Marburg it is also in particular at the Universitäts- und Landesbibliothek Münster in the Nachlass Savigny that papers of and letters to and from Savigny are preserved. The Staatsbibliothek in Berlin got also a number of manuscripts once owned by Savigny which now have the signature Mss. Sav. The Kalliope database for searching papers and autographs in German holding yields a rich harvest for Savigny at several German institutions. Unfortunately today Kalliope could not be reached directly. In fact this makes it even more interesting to look at gateways to archives and libraries, because there is a gateway to Nachlässe, literary papers and letters at the European level which gives you access to the data of Kalliope. MALVINE, “Manuscripts and Letters via Integrated Networks in Europe”, allows you to search in Kalliope, the British Library, the national libraries of Portugal and Austria and three other institutions. Thus you will find a letter by Savigny in the manuscript British Library, Egerton 4207, fol. 140-141, a letter from 1861 to Franz Brentano kept at Graz, but first of all some 1900 entries at Kalliope. Happily a second link to Kalliope does function as it should. The CERL Portal, too, offers access to Kalliope, but this is the only catalogue it shares with MALVINE. It brings you for example to a student’s transcript from 1830 of Savigny’s lecture “Institutionen des Römischen Rechts” now kept at Schwerin, to comments from 1822 on a book about legal history and an undated engraved portrait in the Wallers Manuscript Collection of Uppsala Universitet. The digitization of Savigny’s papers at Marburg in the Savigny-Datenbank has made accessible online a number of manuscripts with notes and drafts of articles, his university lectures, letters, personal documents and miscellaneous papers. The scope and range of Savigny’s correspondence is truly imposing. The Savignyana series is not the only series in which letters by Savigny are published. To mention only a few of the most recent editions, Bernd Reifenberg edited letters to Johann Ludwig Göschen kept at Marburg (Mein lieber theurer Freund… (Marburg 2000)), and letters by and to Savigny are part of volume 31 of the Weimarer Arnim Ausgabe with the works of Achim von Arnim (Werke und Briefwechsel, vol. 31, Briefe 1802-1804, Heinz Härtl and Roswitha Burwick (eds.) (Tübingen 2004)). I hoped to find much more on Savigny at the BAM-Portal for combined searches in the holdings of German museums, libraries and archives, but it is disappointing to find only results from Kalliope, a small number of digitized works – mainly reproducing the list which you get using the Zentrales Verzeichnis Digitalisierter Drucke (ZVDD)- and a few portraits available through the BPKgate. Only for German archives the search at the BAM-Portal gave some twenty results which would not have been easily found separately. The ZVDD does not connect to the digital libraries of the Max-Planck-Institut in Frankfurt am Main, and this diminishes the value of searches in the ZVDD for subjects concerning legal history. It is also frustrating the ZVDD does succeeds bringing you to works by Savigny digitized at Munich for the Digitale Sammlungen, but that you cannot find these books using the Munich interface. Only using the OPACPlus of the Bayerische Staatsbibliothek you can find them directly in Munich. By now you are probably fully aware that the commemoration of Savigny serves here also as an opportunity to conduct research in a number of online portals and gateways, and to comment on their qualities and functions. The Archives Portal Europe is another example of a recently developed gateway to sources. It appears to me as very natural to try using it for purposes touching legal history. A first search for Savigny brings you nine results from France which concern places called Savigny, such as Savigny-le-Vieux and Saint-Jean de Savigny. Of the eighteen search results six are concerned with the Nachlass of Arnold Ruge (1802-1880) at the Bundesarchiv in Koblenz. The Europeana Portal is only slightly better in bringing to light texts by Savigny and images at institutions all over Europe, mainly from Germany, 36 printed texts and 21 images in all, mostly letters and some portraits. The European Library brings you mainly to books by and about Savigny which one can find also in ordinary library catalogues. Only on second thought I looked for institutions holding Savigny’s papers in the Nachlassdatenbank of the German Bundesarchiv, which mentions apart from the collections at Marburg and Berlin also the papers left from Savigny’s time as a statesman kept in the Geheimes Staatsarchiv at the Staatsbibliothek Berlin. Between 1842 and 1848 Savigny had a role akin to that of a special advisor on law to the Prussian government with the rank of a minister. Earlier he had already been a Staatsrat and involved in the Prussian administration. A fourth collection is concerned with Hof Trages, the Savigny family estate. The only Dutch results at this archives portal – still in its beta-version – are notes for an essay on Savigny from 1968 by the late Roeland Duco Kollewijn (1892-1972), professor for international private law at Leiden, found among his papers now kept at the Dutch National Archives. The Dutch portal Archieven.nl is now also available in a German version called Findmittel. It brings only Hof Trages to my attention, an estate in the Hessian village Freigericht-Somborn – near Hanau – still owned by the Savigny family, where around 1800 the Brentano’s, the Von Arnims, the Grimm brothers and the Gunderodes often met. Savigny was first buried at Berlin, but his tomb is since 1875 in the crypt of the family chapel at Hof Trages. More on Hof Trages and Savigny’s agricultural and seigniorial activities can be found in a study by Sebastian Günther, Friedrich Carl von Savigny als Grundherr (Frankfurt am Main, etc., 2000). Let me not forget to notify you that at Thematis, the second Dutch archives portal which connects to thirty archives and a number of image databases, I did not find anything on Savigny. Incidentally the placename Freigericht is in German also the word for the tribunal in a Freigrafschaft and for the late medieval vehmic courts (Femegerichte), secret courts which offered no possibility for appeal. It strikes me as remarkable that Savigny had so to speak a subject of German legal history very often for his eyes, but that he led his research in another direction, the influence and role of Roman law. Did he perhaps react against the romantic views on German medieval history of his contemporaries, in particular within the circle of Romantic poets with whom he was personally acquainted? Did he leave the study of medieval German law on purpose to his scholar Jacob Grimm? No doubt this question, too, has been dealt with in the very extensive literature on Savigny who had a pivotal position both in the organization of legal Germany and in the German Romantic movement. Savigny’s library has not been held together after his death. A rather large number of books was sold in the twentieth century to libraries in Japan. In the Savigny-Bibliothek of Toin University in Yokohama some of the books once owned by Savigny have been digitized. Kyushu University Library holds a number of manuscripts with some of Savigny’s lectures and lectures by a number of his contemporaries. Heinz-Peter Weber published a book on Die Bibliothek des Friedrich Carl von Savigny in der Universitätsbibliothek Bonn (Bonn 1971). The collection at Bonn sold to this library by the Savigny family in 1959 is truly remarkable, even if some twenty percent of Savigny’s books is no longer in Germany. Much more can be said about Savigny, one of the few German lawyers who gave his name to a foundation, the Savigny-Stiftung, responsible for the publication of by all accounts one of the most important legal history journals, the Zeitschrift für Rechtsgeschichte. Savigny opposed vehemently the codification of German law and helped bringing the study of Roman law at new heights. Even now his views sometimes divide German legal historians. Whenever the sparks of such clashes of opinion lead to new questions and renewed research on the developments and impact of law and justice in history this can only be helpful and enriching. This entry was posted in Scholars and tagged Archives, Germany, Legal history, Legal iconography, Medieval law, Roman law, Romanticism on October 25, 2011 by rechtsgeschiedenis. Is er ooit een Engelse vertaling geleverd van Zum Beruf unsere Zeit? Hartelijk dank voor deze vraag! Er is een Engelse vertaling gemaakt door Abraham Hayward, Of the vocation of our age for legislation and jurisprudence (Londen 1831), gedigitaliseerd te lezen in de Hathi Trust Digital Library, http://hdl.handle.net/2027/mdp.35112104432143. Een recente herdruk ervan is verzorgd door Lawbook Exchange (Union, NJ, 2003). Recente vertalingen zijn vaak te vinden via de Index Translationum van de UNESCO, http://www.unesco.org/xtrans/bsform.aspx.